At first glance, the titles of the two pieces in Set B of Q-Stage from 20% Theatre Company aren’t a lot of help. The first one is called "___________" and the second one is called “e”. But, actually, once you see them, the titles are kinda perfect. It’s that kind of show. Both deal with queer and trans bodies, the first piece through scripted performance, the second piece through dance and spoken word. Both works in progress are still finding their final form, but each of them contains a lot of powerful material. Of course that doesn’t mean they’re always easy to sit through. The first half of the evening, “___________”, is the most challenging on that score. Written by Sami Pfeffer, who also co-directed with Kai Greiner, both developing the piece with their performers, real-life spouses Beckett Love and Suzi Love, "___________" is about being haunted by and not entirely able to escape an emotionally abusive relationship. The piece inspired trigger warnings in the lobby, in the program, as well as in the welcome speech by Beckett. Audience members were advised to do whatever they felt they needed to in order to look after themselves, including leaving the theater for the lobby if necessary. Someone next to me did just that partway into the piece. They admitted upon their return for the second half of the program that they just couldn’t make themselves watch it anymore. "___________" doesn’t abuse the audience, but it’s definitely hard to watch. One of “___________”’s primary goals seems to be to get the audience to recognize that abuse occurs in queer couples just as it does in straight couples, and that psychological abuse can be just as damaging and long-lasting as sexual abuse, or the kind of abuse that leaves a bruise you can see. It’s been a battle just to get the larger society to see queer people of any sort on the most basic existential level. Seeing other problems queers face on top of that is yet another challenge of perception. "___________" tries to meet that challenge and bridge that gap. This draft of the piece may be a little too good at what it does. It’s so convincing as a story of abuse that it’s almost unwatchable. That’s actually a badge of honor for writer, directors and performers alike. The trick for the next go-round of "___________" in its development is to find a way to get people to walk into the theater in the first place, and then to find a way to keep them from giving up on the story because it’s too painful. It’s good that venues like Q-Stage exist, in which challenging stories like "___________" can be incubated. I’m not sure how it would survive its infant stages of development if it didn’t have 20% Theatre lifting it up and giving it a platform from which to speak. It’s been difficult for me to write about this, not because I’ve had this sort of abuse in my own life, thankfully, but because I’m struggling with the whole notion of how you tell a difficult story but still reach an audience with your intended message. In the present, post-breakup, Suzi’s character works for a cheesy tourist attraction that purports to take groups in search of spirits in a haunted house. The idea of being possessed and haunted is a good match for the character’s real life. Right now it might be a little too on-the-nose. If the script leaned on it a little less, let the audience come to it, rather than having it handed to them, the impact of the revelation might feel a bit more genuine and earned. It’s a tricky balance and "___________" is almost there. "e" seeks to explore the intersections of race and gender identity in an interdisciplinary artistic format. 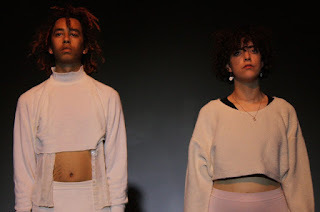 two queer trans people of color articulate through movement, poetry, music, storytelling and performance art their experiences in the complex and beautiful bodies they live within. "e" touches on the stereotyping of trans-femme bodies, the exploitation of queerness and eating disorders' attachment to dysphoria. we will create our own trans queer narrative. when our voices have often been rendered silent, we will speak our truth. so often the conditioning of our bodies by mainstream media is cis and heteronormative, our racial identities are merely supporting characters or punchlines. "e" stands for exposure. stands for empathy. stands for estrogen. for elevation, enigma, evil. What does that look like in practice? Creator/performers Simone Bernadette Williams and Holo Lue Choy fill the stage alternately with movement and words. Williams does nearly all the talking, Choy does more than their share of the movement. Choy is one of the best arguments I’ve seen for the notion that dancers are most definitely athletes. The things they can do with their body are mesmerizing. I can only imagine the degree of difficulty involved. It’s great seeing Williams and Choy dance together, too, but whenever Choy solos, they’re a marvel. Williams key strength is putting trans struggles into words - a poetry at once defiant and beautiful. They are the show’s voice, and it is a powerful one. Both artists make it clear, you do not want to mess with them. They will fight back. Here in “e” we again have an issue of what the ultimate message is. The pieces of the puzzle don’t appear to be arranged in any particular order. Each in their own way are very effective. But collectively they aren’t currently adding up to anything larger. The audience isn’t brought to any particular end point. The piece just - stops. Real life, of course, is not all one thing, headed resolutely in a certain direction with no turning or doubling back. But art has the advantage of being able to take life and arrange it in a way that life can almost make a kind of sense. In “e” one thing happens after another, but one thing doesn’t necessarily lead to another. Immediately before the ice cream moment, there’s a solo moment where Williams has been overwhelmed with emotions not entirely positive while painting on their naked body. This, like many juxtapositions across the evening, is striking but I’m not entirely sure the artists have decided what they want to get out of putting these two moments side by side. It doesn’t feel so much like a choice as it does just something that happened. Earlier there are several instances of dead air and silence on an empty stage which, if the components of the evening where arranged differently and the gaps eliminated, would have given the piece a better shot at building momentum from the beginning through to the end. Less stops and starts means more collective impact. How do you get one piece to feed into the next, to get something to build on what came before it? That seems to be the business of the next draft of this performance. But in the meantime, dang, the words and the movement here are powerful. 20% Theatre’s Q-Stage series as a whole feels like it’s reached another level of maturity this year. The artists all seem more self-assured and in command of their craft, and the presentations - even when still rough and unfinished - have a real polish to them this time. It’ll be exciting to see what all these artists do next, and who Q-Stage extends its hand to next. The next time Q-Stage comes around, you should go and see for yourself.